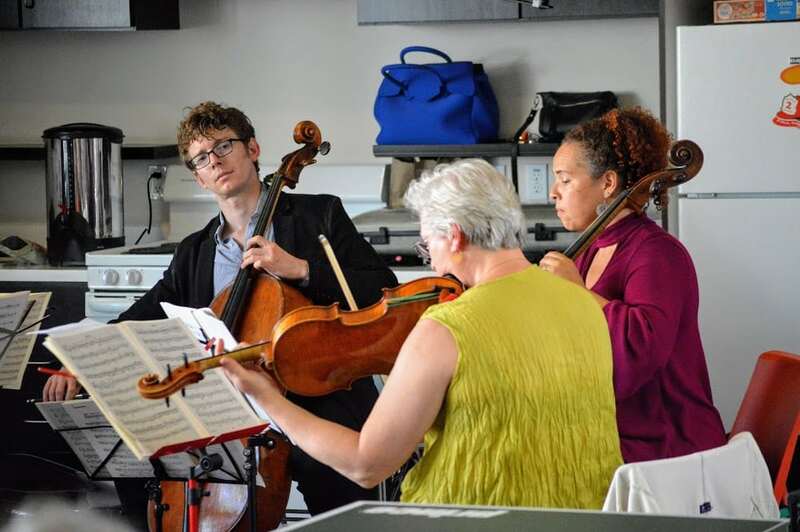 Joshua Roman, the Orchestra’s 2018 Shaheen & Anil Nanji Guest Artist-in-Residence, performing with cellist Giovanna M. Clayton and acting principal viola Victoria Miskolczy at Noho Villas’ community center. 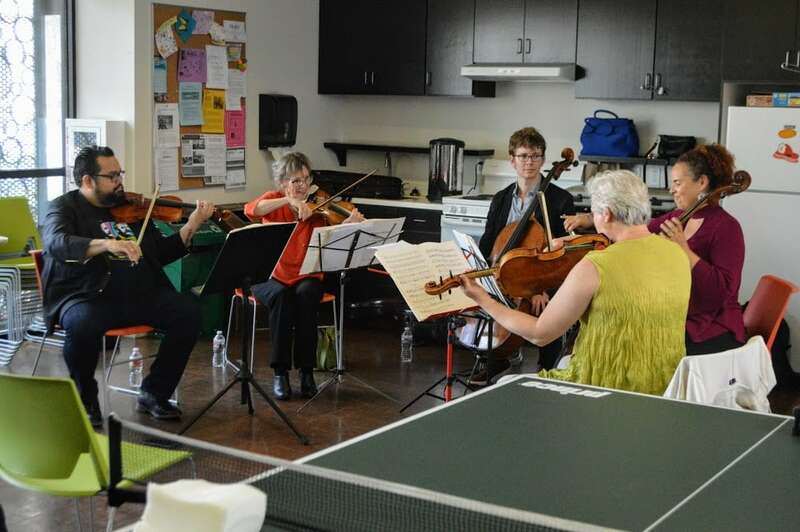 On May 18th, three members of Los Angeles Chamber Orchestra and two special guests — including cellist Joshua Roman, the Orchestra’s 2018 Shaheen & Anil Nanji Guest Artist-in-Residence — arrived at the Noho Villas’ community center to fill the space with chamber music. The atmosphere at Noho Villas isn’t exactly what you’d expect from a structure designed to house homeless and low-income seniors. Located in NOHO’s Arts District and built by the nonprofit People Assisting the Homeless (PATH), native plants and thoughtful water features exude a warm and welcoming vibe. 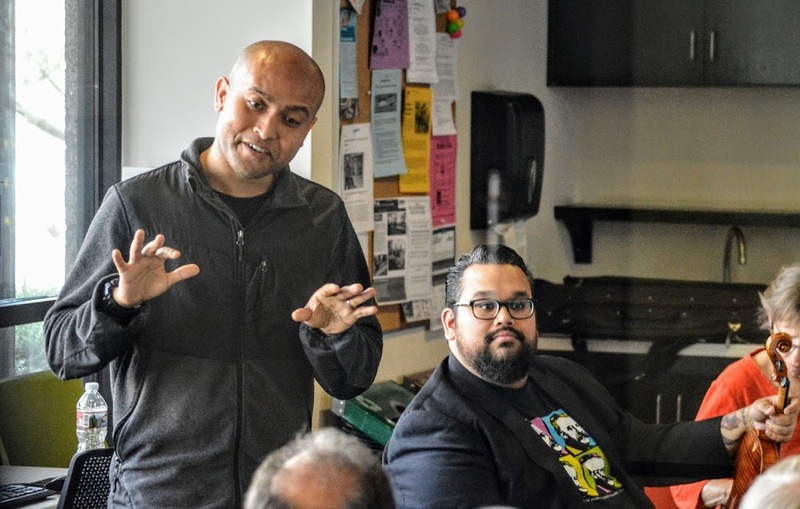 Joshua, who is also recognized as an accomplished composer, curator and programmer, particularly in his work as artistic director of Seattle Town Hall’s TownMusic series, developed this program to be performed for under-served communities in Los Angeles. The concept featured music by living composers, Derrick Spiva, Jr. and Reena Esmail, as well as material related to the cello player’s upcoming Orchestral series performance. 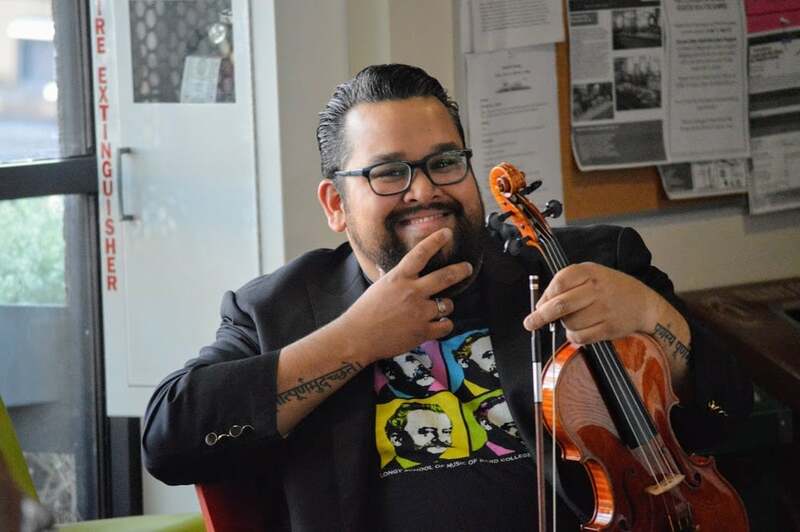 Vijay Gupta – Violinist, Founder and Artistic Director of Street Symphony — which uses classical music as a platform for social action — and LACO violinist Connie Kupka at Noho Villas’ community center. Joshua was joined by Vijay Gupta, Founder and Artistic Director of Street Symphony — which uses classical music as a platform for social action — and LACO violinist Connie Kupka, cellist Giovanna M. Clayton and acting principal viola Victoria Miskolczy. Gulbahar Ashimova, a visual artist and resident of the 49-unit development was particularly keen on the message of cultural plurality found in the music of Derrick Spiva, Jr. Derrick was also travelling with the group and personally introduced the work. The concept featured music by living composers, Derrick Spiva Jr., Composer and Reena Esmail, Composer, as well as material related to Joshua Roman’s upcoming Orchestral series performance. The Orchestra was thrilled to collaborate with a virtuoso musician while partnering with visionary organizations like Street Symphony and PATH. 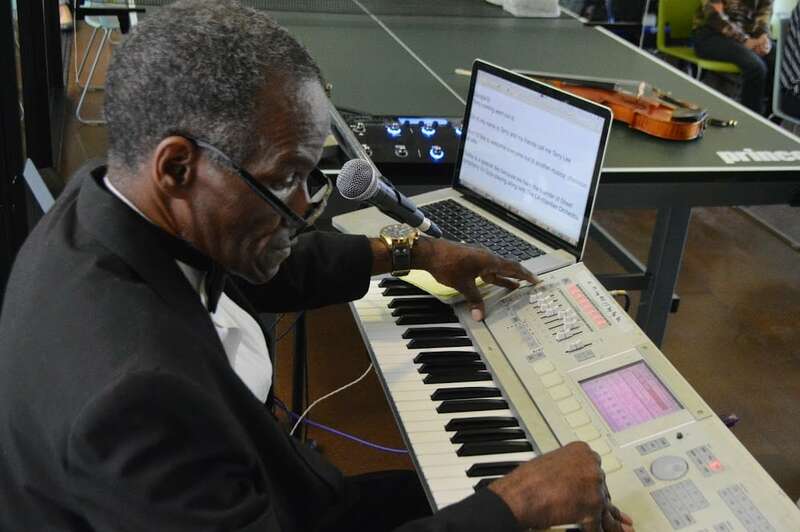 Street Symphony uses music to help the city’s most at-risk residents. PATH’s mission is to end homelessness for individuals, families, and communities. They do this by building affordable housing and providing supportive services throughout California. LACO’s guest artist residency program places Angelenos front and center for intimate and accessible musical experiences with world class musicians. 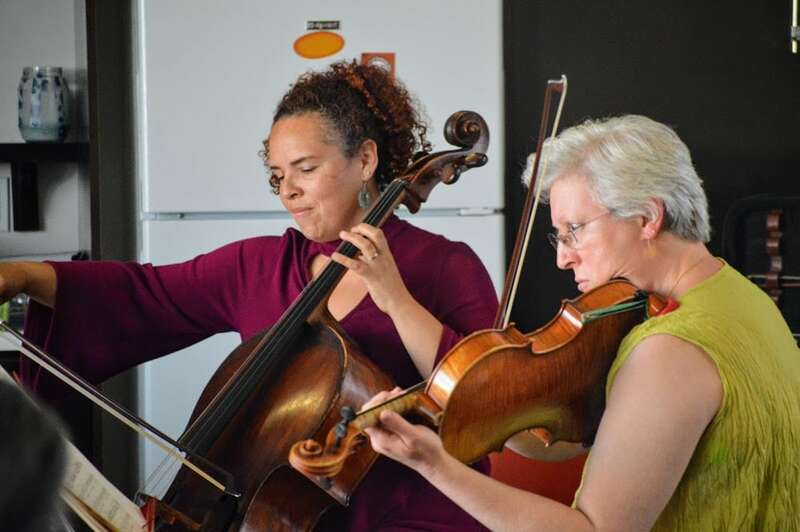 Over the course of the week-long residency, Joshua, Vijay and the LACO ensemble brought the free community program to several other venues including the California Institution for Women. 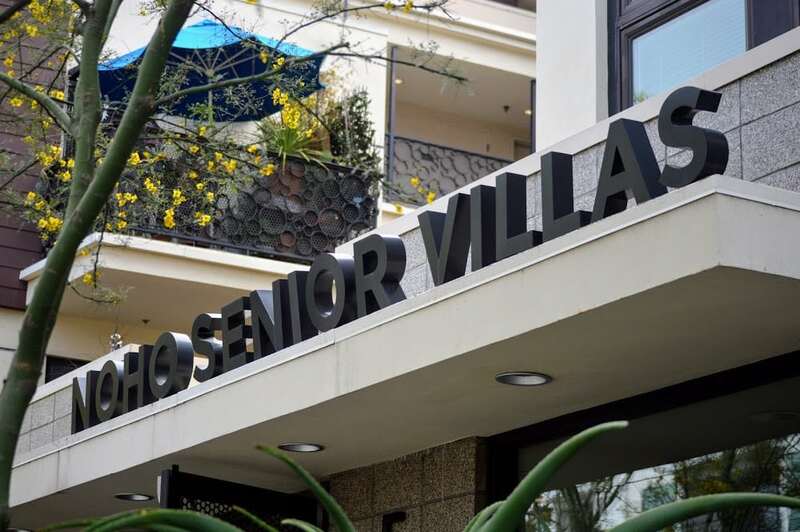 The atmosphere at Noho Villas isn’t exactly what you’d expect from a structure designed to house homeless and low-income seniors. Located in NOHO’s Arts District and built by the nonprofit People Assisting the Homeless (PATH - Making it Home), native plants and thoughtful water features exude a warm and welcoming vibe. — at Noho Senior Villas. Joshua Roman and Vijay Gupta - Violinist, Founder and Artistic Director of Street Symphony — which uses classical music as a platform for social action — performing with LACO violinist Connie Kupka, cellist Giovanna M. Clayton and acting principal viola Victoria Miskolczy. — with Vijay Gupta - Violinist, Joshua Roman and Giovanna Moraga Clayton at Noho Senior Villas. Terry Lee, the "musical ambassador" of PATH - Making it Home's Noho Villas, introduced Joshua Roman's group with flair, style and a compelling piano solo. — at Noho Senior Villas. 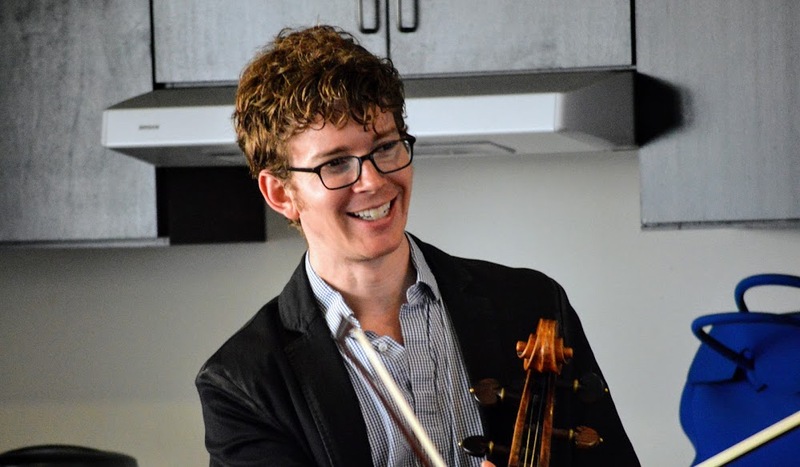 Joshua Roman, the Orchestra’s 2018 Shaheen & Anil Nanji Guest Artist-in-Residence, performing with cellist Giovanna M. Clayton and acting principal viola Victoria Miskolczy at Noho Villas’ community center. — with Joshua Roman and Giovanna Moraga Clayton at Noho Senior Villas. “It is a great pleasure to be here and playing music with old friends and new friends as well,” noted Vijay Gupta - Violinist, Artistic Director of Street Symphony. “If we were to sit alone in a room and play this music, I can tell you that it wouldn’t be the same, and that this music is only what we love and play because it is received as such.” — with Vijay Gupta - Violinist at Noho Senior Villas. Joshua, who is also recognized as an accomplished composer, curator and programmer, particularly in his work as artistic director of Town Hall Seattle’s TownMusic series, developed this program to be performed for under-served communities in Los Angeles. — with Joshua Roman at Noho Senior Villas. The concept featured music by living composers, Derrick Spiva Jr., Composer and Reena Esmail, Composer, as well as material related to Joshua Roman’s upcoming Orchestral series performance. — with Derrick Spiva, Derrick Spiva Jr., Composer and Vijay Gupta - Violinist at Noho Senior Villas. 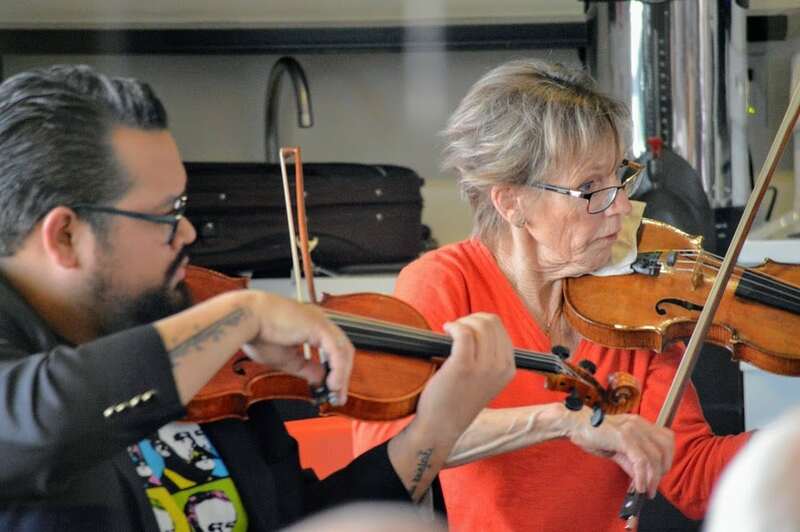 Vijay Gupta - Violinist, Founder and Artistic Director of Street Symphony — which uses classical music as a platform for social action — and LACO violinist Connie Kupka at Noho Villas’ community center. Connie, a native Angelino, grew up in a musical family along with two other siblings, both of whom are also performers. — with Vijay Gupta - Violinist at Noho Senior Villas. LACO cellist Giovanna M. Clayton is a familiar face in the Hollywood music scene, performing live and recording with artists such as Andrea Bocelli and Stevie Wonder. Australian-born Victoria Miskolczy has been associate principal viola with LACO since 1989. — with Giovanna Moraga Clayton at Noho Senior Villas.